The two awesome SSH clients that I will use for comparison are ConnectBot Android SSH Client and JuiceSSH Android SSH Client. I have made comparisons based on the simplicity with respect to user experience, feature set, and style and customization options of each of these Android SSH Client app. 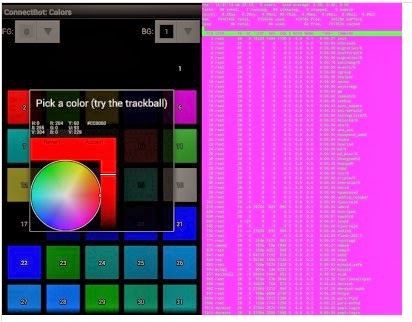 I think many people will say their Android phone will not be the primary device for administering their servers, so when you are not near a computer and just want to run some quick updates, you certainly don’t want to be messing around with a poor interface to get your work done. In this case ConnectBot Android SSH Client was the clear winner for me, simply because the user interface barely existed, where JuiceSSH Android SSH Client had me browsing through menus and options for configuration, ConnectBot Android SSH Client just asked for a username, hostname, and password, and the work was done. 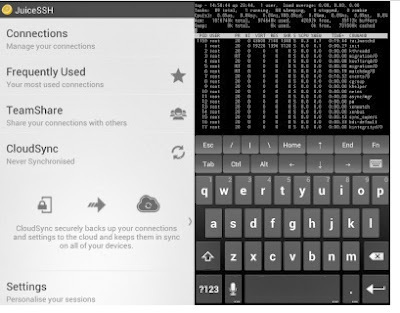 If you are a using SSH a lot and have a large number of servers, you need immediate access to all at times, you will probably want a more out of your Android SSH Client , and with features like synchronization between the devices, this time I go for JuiceSSHAndroid SSH Client hands . It takes a bit more configuration than ConnectBot Android SSH Client, but the end result is 1 touch access to any server you set up, from any of your devices. Colour customisation is completely missing in JuiceSSH Android SSH Client, ConnectBot Android SSH Client wins this one by default, but that doesn’t mean it isn’t worth mentioning the truly extensive colour control in ConnectBot Android SSH Client, as seen in the images below. In summary, both apps are great and would suit anybody looking to make SSH connections from their Android device, however due to its simplicity and low footprint I will likely be sticking with ConnectBot Android SSH Client for the time being.